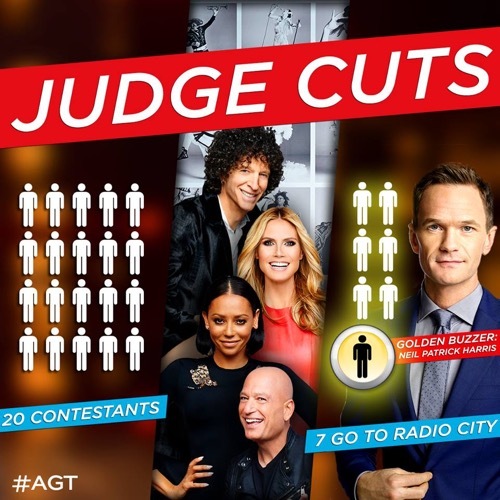 Tonight on NBC America’s Got Talent returns with an all new Tuesday July 14, Season 10 episode 8 called “Judge Cuts 1”. We’ve got your recap down below! On tonight’s episode Neil Patrick Harris serves as a guest judge. Here, the auditioning acts have their last chance to wow the judges. On the last episode, the auditions continued. Did you watch the episode? If you missed it, we have a full and detailed recap right here for you. #AGT tonight is Judge’s Cuts and there is a special guest to help. It’s freaking Neil Patrick Harris! #NPHonAGT – apparently Neil is a huge fan of the show and he says he does trapeze and juggles then demonstrates by juggling donut holes. Nick greets NPH and the judges and says 20 acts are backstage but only seven will get to move on to Radio City Music Hall. Neil gets a special golden buzzer – he can send one act straight through. He hits the buzzer and douses Nick in gold confetti. Nick says he wasn’t supposed to press it now and says they have to clean up. NPH says Nick gets to go straight through to Radio City Music Hall. Howard tells NPH to apologize to the crowd for making them wait while they sweep the stage and he does. First up is dance act Freelusion. Neil says this is magical and illusion and says it’s what this show is about and he thinks they’ll go far. Howard says good job but reminds them with these drastic cuts, you never know what will happen. Next out is the hat juggler Paul Ponce who has a soccer ball this time. He does a cool act but it’s just soccer ball balancing. Howard gives him the red X. Heidi says she liked it and says it was flawless. Howard says it was a guy bouncing a ball on his head. Mel B says it started off mediocre then got more interesting. Howie says it was good until he touched him. NPH says he loves jugglers and this is a touch decision. Next up are Paul Ponce’s parents Sylvia and Victor. Victor blows up a balloon and balances it on a knife in his mouth with a wine bottle balanced on that. She shoots the balloon and the wine bottle falls to the knife. Then she puts an apple on her head and she shoots a crossbow at another crossbow that triggers a series of crossbows and the last one shoots an apple on her head. The crowd goes wild. Howard says he feels bad for her son and says it’s amazing that she’s so hot at 60 and says her husband must be happy. Howard says the staging was even better this time. NPH says he likes a grandma shooting the crossbow. Mel B says bravo. The Chapkis Family is a large troupe of dancers led by Michael Chapkis. NPH tells them he loved their high energy number and the use of the lights. He says it was smart design. Mel B says it was intricate, fresh and fast. Howard says it was just too busy, too much and didn’t allow them to engage with the audience. He says they may not move on. Heidi says it was great. Howie says he didn’t think it was busy because it was so synchronized. The judges are split on this one. Next up is the professional cuddler who talks about how she self-certified in cuddling. The other judges insist that NPH be the volunteer. Samantha Hess has Neil sit and she shows him the fortune cookie cuddle. She gets behind him and wraps around him and he says she feels like a monkey on his back. She sits next to him and hugs him sideways. The crows starts booing. Howard already x’d her then Howie and Heidi join in. Samantha then has Neil lie down on his back while he lies on his lower torso. That gets Mel B to x her too. Howard says there is nothing he likes about her act and says her hugs made Neil miserable. Howie asks NPH how it was to be inside her fortune cookie. Nail says this is odd and doesn’t seem right for AGT. Nick gives the professional cuddler a hug backstage to comfort her. With our x’s, she is out of the running for Radio City Music Hall. Tiny kid dancers Elin and Noah do another crowd pleasing performance and the judges give them kudos too. Then the LA Children’s Orchestra does another beautiful performance. Nick gives them high fives all around. Next is powerhouse teen mariachi singer Alondra Santos. She does another flawless performance. It’s amazing. Heidi says it was beautiful. NPH says he loved it and she sings incredibly and her family should be very proud. Howie says he feels like he’s at a beautiful Quinceanera. Howard says it’s amazing her being 13. He says he doesn’t know what she’s singing and didn’t know the song but he still really enjoyed it. He says she’s special and wants her to go through. Magician Michael John is next. He has Howard put his initials on a quarter and has Mel B put her initials on the other side. He has a metal can and slaps it against it. He rattles the can so Neil can hear a noise. Michael then opens the can and pours out the soda. You can hear the coin. The trick is going slow and Howard buzzes him. He gets the coin out and hands it to Mel B. She asks Howard why he buzzed him and Howard says his presentation is too quiet and he’s not playing to the larger crowd. Mel B agrees. The judges all thank him. Michael is upset that it didn’t go over that well. NPH says he needs more character. Next up is Piff the Magic Dragon and he has a tiny dog also in a dragon costume. The dog is Mr Piffles. He pops out his stand that says Piff and introduces his dog. Piff calls Heidi up again to be his volunteer. He asks her to grab a card. He tells her not to let the dog see. He says the dog will find the card. He asks if Heidi likes small animals. She says yes and he asks if she wants a little cuddle. She says yes so Piff offers her one. He says Mr Piffles will find the playing card. He says the dog will throw up all the cards and give him the right one. Then he says the dog changed her card and got rid of her initials. He says the dog is sorry and says he’s on hunger strike and says no food, no card. He opens the can of dog food Heidi was holding and pulls out the card that Heidi signed. Mr Piffles licks the dog food off. When Heidi goes to kiss Piff on the cheek he turns his head to kiss her on the mouth. He proceeds to make a sandwich while the judges talk. Howie asks can’t he wait and he says the dog food made him peckish. NPH slaps the golden buzzer for Piff to send him straight to Radio City Music Hall. He brings his ham sandwich to NPH and says he earned it. Mel B is stunned when Neil actually eats the sandwich. He high fives the other judges and Howard says he loved NPH’s choice and loves the guy’s I don’t give a damn attitude. Duo Ignite does their aerial fire act and the crowd loves it. NPH’s jaw literally falls open. Next up is comedian Myq Kaplan. He says he seems gay but he’s just a vegan. He has some really funny jokes and Howard says he would love to see a comedian win it and Howard tells Neil that he should be a character on a TV show. Myq says he’s working on a show called How I Met Your Brother from Another Mother. Heidi says finally a comedian who made her laugh. Howie and Mel B loved him too. A singing guy duo got x’d by Howie who calls them a cruise act. Howard says they haven’t perfected it and it wasn’t good enough to move on. Another duet is worried as they watch. Another singer gets the boot for nerves. Next is Three Shades of Blue, a rock group made of three brothers and their buddy. They are awesome and crush it. Howard says he loves them and Neil says they are great too and leave a good impression. Heidi says it was good and they are all handsome. Mel B says she’s not a fan of the song but is a fan of theirs. Howie says they are great and America will vote for them if they get through. We see a dancing acrobat type who does well. The guy gives NPH a wink. Then X-Treme Tumbling takes the stage and does another cool number. They get raves from the judges. Next up is Grand Master Qi who does Kung Fu. They call Mel B and Neil to the stage. They have Mel and Neil hold newspaper and tell them he will use his energy to set it on fire. Heidi slaps her buzzer and Mel B says it’s negative energy. They have the crowd chant fire. They do. Then Howard and Howie slap the buzzers just as he sets it on fire. Neil says it just didn’t work and Heidi says she voted against him last time and this time. Next up is Samantha Johnson who sings beautifully again. NPH says she was hypnotic. Mel B says she’s mind-blowing. Neil says there are so many shows that do singers so the cards are kind of stacked against them in AGT. He says she’s extraordinary. Heidi says she has something special. That’s six and the seventh for the night is Piff the Magic Dragon that Neil pushed the golden buzzer for – that’s it!